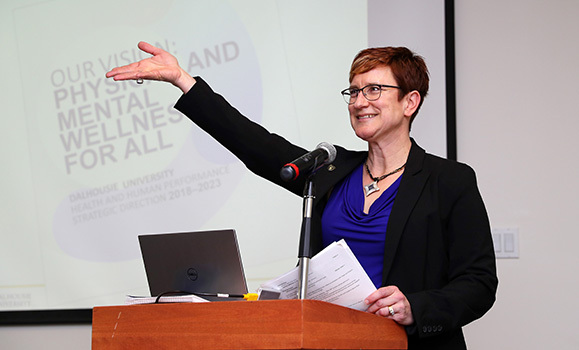 The School of Health & Human Performance (HAHP) launched their Strategic Plan on Wednesday, February 27th in the Wayne Cross Room at the Dalhousie Student Union Building. In attendance were faculty, alumni, staff, and students from the School of HAHP in anticipation of the School’s first strategic plan in over 19 years. The plan outlines a vision of physical and mental wellness for all based around 4 pillars: enhancing the scholarship of teaching and learning, amplifying research, fostering partnerships, collaboration and outreach, and shaping impact. The development of the strategic plan involved feedback from faculty, alumni, staff, students and various stakeholders, with students in particular interested in the idea of fostering partnerships, collaboration and outreach. “Students were very excited by the prospect of working collaboratively together and with various partners. In their feedback they really illustrated that this pillar is what they think is going to move the school forward,” said Rehman. Short videos were shown to showcase some of the innovative research and teaching coming out of the School of HAHP, from designing hockey equipment using state of the art camera technology to practising mindfulness meditation as a regular aspect of classroom teaching and learning. “We have faculty who are doing some extremely innovative things,” said Rehman. “They are engaging in research and using it to inform innovative practises that will influence student learning and student experiences.” Rehman is looking forward to moving forward with the School of HAHP on their new strategic directions.